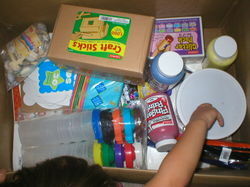 ...to be three years old when your curriculum box arrives in the mail! As I've pondered each child the past few weeks and begun to design programs of studies tailored especially to each of them, Katie has been my easiest to plan. This child just plain exudes joy. Everything is happy! In so many ways, she reminds me of her "biggest brother." I have a picture of Michael when he was her age posted just above my computer monitor. 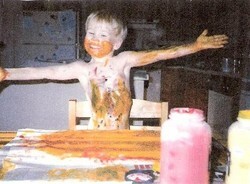 He is covered in fingerpaint, with his arms spread wide and his smile spread wider. It serves two purposes: to remind me to back away from the computer and to remind me of a time when I wholeheartedly encouraged giant messes of creativity. This is my blond-haired, blue-eyed golden boy's last year at home. We've begun the process of finding a college and I think I can safely claim to have some perspective on home education. That perspective certainly colors plans for everyone else. I don't want to push the stages of development, nor do I want to fold one stage into another without stopping to really notice and savor it. One thing I find is that the younger children in a large family tend to get folded into the school-aged crowd. The veterans tout all the benefits of "trickle down" and advise that we teach to the oldest when we take the whole family as a group. If we are not careful, they miss all those wonderful early childhood treasures that we cultivated so happily for our first children. I am determined not to let that happen, if for no other reason than I LOVE early childhood and all the good things it holds. Mounted with the picture, just above my computer monitor, is this poem, taken from the Five in a Row website years ago. I’d build self-esteem first, and the new house later. For the most part, I lived that philosophy with Michael and I have few regrets. 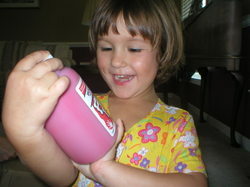 So, with the poem and the picture as my inspiration, finger paint became the focus of Katie’s “official pre-school,” at least metaphorically. And how silly is this notion of "preschool" when you know there is no school at all planned after a “preschool” that isn’t even school itself?? Ah, but I digress. Finger paint really is a glorious medium! We’ll unpack the rest of the box tomorrow.